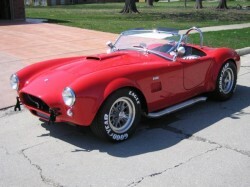 If you are going to own a Cobra, then own one most like the iconic original. This car gets all the looks at shows and on the street. Car is a Unique Motorcars, which is one of the most accurate replicas. The car was built to be accurate in detail. Car was built by an engineer in NY and had a 302 engine, designed for the track. But to keep with the original design (at approx 1,000 miles), a professional built, blue printed Ford 289 motor with solid lifters. Block is 1965 casting date, with 1969 351 Windsor cylinder heads that are ported and polished; compression ratio is 10.3 to 1 was installed. Ceramic coated headers and exhaust finish the compartment. Engine makes 311 HP at the rear wheels (365HP flywheel) and runs perfect. (No over heating like a big block and you don't need any additional power) Everything in the motor is top of the line. Mated to a Ford Toploader 4 speed transmission. Rear end is a narrowed Jaguar IRS, 3.54 gears and limited slip differential and inboard disc brakes, rear mounted trailing arms. Front suspension is Carrera coil over's with upper and lower A arms designed by Unique Motorcars and Wilwood disc brakes. Disc brakes are operated by dual master cylinders with a balance bar at the pedal, adjustable with a knob under the dash. Safety: Lakewood blow proof bell housing, drive shaft safety loop, Simpson 4 point harnesses, and functional roll bar. All gauges are SW and period correct, battery shut-off, rear-mounted battery, correct turn and tail light lenses. Car was built in 1994 and has 14K miles on it. Have tonneau cover but never installed. Car has newer tires and has been completely aligned. Drives very smooth and straight like it's on rails. This car is spectacular and the red paint and finish is second to none. I have owned a lot of cars and this one makes you remember why you like cars.